The village of Bon-Repos is situated in La Plaine-du-Cul-Sac and is located approximately 8 miles north of Port-au-Prince, the capital of Haiti. Until the late 1970’s, Bon-Repos was a vast open space primarily used for agriculture. As more families from the countryside moved to the capital in search of opportunities, former rural areas continue to be encroached. Today, Bon-Repos is primarily a poor and over-populated suburb of the capital city. Access to health clinics and schools is very limited. One of the biggest needs throughout the country is access to clean potable water and one of the first community projects undertaken by the Foundation was the installment and maintenance of a water pump. Additionally, RENMEN works with and assists families providing them with resources such as emergency financial support, emotional and psychological counseling, after school and weekend programs, food, clothing and education. Medical personnel are welcomed and whenever possible, the orphanage opens a one or two day clinic to provide neighborhood families dental and medical services. Please contact us if you are interested in volunteering medical or dental services. 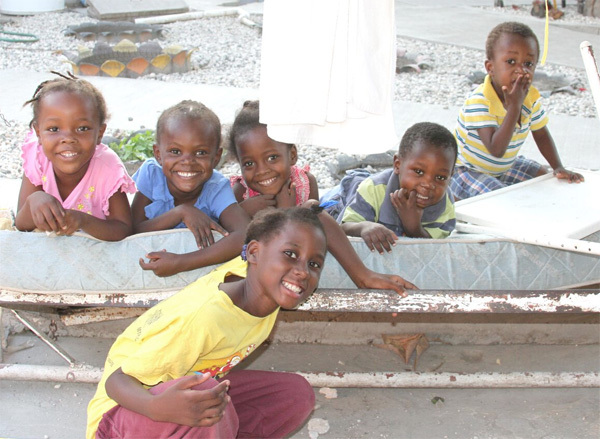 The orphanage runs a small guest house which is open to volunteers who are working in Haiti. The facility is comfortable, safe and clean.